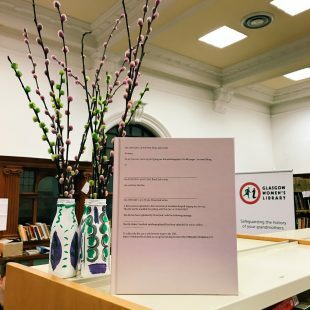 In this blog post we hear from Laura Matheson who has joined Glasgow Women’s Library as an exhibition intern as part of her course MSc Modern and Contemporary Art: History, Curating and Criticism at the University of Edinburgh. As we become more and more excited by Fiona Jack’s forthcoming exhibition ‘Our Red Aunt’, Laura talks to us about Helen Crawfurd – whose legacy is at the heart of the exhibition. Our Red Aunt runs from Friday February 2nd – Saturday March 17th, during library opening hours. Join us at the exhibition launch on Thursday 1st February or Fiona Jack’s Artist Talk on Saturday 3rd February. Helen Crawfurd: Scottish suﬀragette. Before starting my work placement at Glasgow Women’s Library last year, my knowledge of Helen did not extend far beyond those words. A quick search online revealed little more; what was clear was that she seemed to divide opinion. As my research progressed, a conﬂicting portrait developed. Lesley Orr writes of a ‘remarkable woman’, who ‘deserves recognition alongside Hardie and Gallacher as one of the most important and inﬂuential ﬁgures in the development of left wing politics in twentieth-century Scotland’. Others dismissed her memoirs as ‘tainted by Stalinism’ and ‘… more interesting for what it leaves out than what it actually has to say’. Contemporary accounts were little diﬀerent. The letters of fellow suﬀragettes speak of her kindness; Frances McPhun remembered Helen sneaking her writing paper while they were both imprisoned in London for smashing windows, and her tears of empathy. On the other hand, the Home Oﬃce held communication from a civilian spy to ‘warn’ them about a ‘Mrs Crawfurd’, who was ‘causing a terrible discontentment among the munitions’ and was generally quite ‘suspicious’. Labels frequently appeared: suﬀragette, activist, politician, and in more hushed tones, communist. Admittedly, I was intrigued. Helen’s own voice, her motivations and reﬂections, had remained concealed in her unpublished autobiography, held in the Marxist Memorial Library in London. Elspeth King notes that like many of her suﬀragette contemporaries Helen was encouraged to minimise her personal recollections in favour of historical context in her memoirs, as this would be of more interest to publishers. The result of this was that her perception as a woman in this troubled period of European history has been obscured. Of course, despite following her peers’ advice, the text was never published, and is in fact currently catalogued alongside a rejection letter, dated 1972. It was fortunate for me then (and I’m certain for many others), that for the ﬁrst time the complete autobiography has been retyped, and is presented in Fiona Jack’s upcoming exhibition Our Red Aunt, as a collaborative artwork interspersed with Fiona’s own investigation into her Grand-Aunt’s life. It was exactly this erasure of women’s voices from history-building that impelled Fiona to produce an exhibition which responds to Helen’s neglect in both Scotland’s and her own family’s story. Thus, it was through her own words that I came to know Helen Crawfurd. The autobiography introduces a multi-faceted woman who was both intelligent and well-travelled as much as she was tireless, hardworking and committed to her beliefs. From Helen’s birth in the Gorbals in 1877 (‘around tea time’ she helpfully notes), we follow her political development. Her awareness of women’s position in society seems to have been acute from even an early age. She remembers as a child being given less than her brothers to spend at a local fair, and shouting ‘damn!’ as she threw her sixpence to the ground at this ‘suggestion of the inferiority of women’. Her father was a master baker, and his business took the family to Ipswich, before returning to Scotland in 1894. The living conditions of the city’s industrial workers were a great shock to teenage Helen, in an early politically shaping moment where she ‘began to think that there must be something wrong with a system that would allow this.’ She married a local minister in 1898, and began to train as a missionary, following her religious upbringing. This background strongly inﬂuenced her early political work, which she described as ‘Christian socialism’, as well as allowing her a deeper understanding of the attitudes of Scotland’s religious women. Her interest in female suﬀrage developed through exposure to public speakers, and she joined the Women’s Social and Political Union (WSPU) at a meeting in Rutherglen in 1912. She accompanied a group of women travelling to London for a raid, inspired by her husband’s sermon into believing that ‘If Christ could be militant, so could I’. Shortly after her arrival, Helen was imprisoned for the ﬁrst time in Holloway for breaking the windows of the Minister for Education. She recounted refusing the police’s oﬀers to transport her in a taxi because she was a ‘welldressed’ woman, preferring to travel in the police van with the other prisoners. Back in Scotland, in 1913 she was a bodyguard for Emmeline Pankhurst during her visit to St Andrew’s Hall in Glasgow, where she witnessed police brutality; oﬃcers had emerged from their hiding place under the stage where Emmeline was due to speak to baton women in the audience. Helen recalls being held by two policemen ‘minus my hat, my hair streaming down my back, and every button oﬀ my costume jacket’. Incensed, her second prison sentence was served later that year in Glasgow’s Duke Street prison for breaking Army Recruiting Oﬃce windows, where she was on hunger strike for eight days. Released under the Cat and Mouse Act, Helen faced being pelted with rotten fruit in Perth, accusations of bombing the Botanic Gardens (which she denied and refused to provide ﬁngerprints), and a third spell in prison on account of fears she planned to attack the visiting King and Queen. In an additional blow amid the political turmoil, tragically both her husband and mother died in 1914, but this and the outbreak of war did little to deter Helen. During the war Helen became a peace campaigner, working with the Women’s International League and the Woman’s Peace Crusade. She would later describe her ‘profound hatred of war with all its ghastly cruelty and waste’. Support for the conﬂict demonstrated by some members of the suﬀrage movement had convinced Helen to turn her back on them, culminating in a dramatic incident at a meeting in Glasgow where she mounted the stage to shout ‘Shame on you Christabel Pankhurst!’ and narrowly avoided a jug of water being poured over her. In 1915 she worked with Mary Barbour and others in the Glasgow Women’s Housing Association to oppose increased rents as a result of proﬁteering landlords seeking to capitalise on wartime manufacturing in Glasgow. What has become known the 1915 Rent Strikes saw 20,000 tenants refusing to pay inﬂated rents, women throwing ﬂour and wet clothes at bailiﬀs who tried to enter tenements, and culminating in thousands peacefully marching on Glasgow’s Sheriﬀ Court. During the First World War, Helen had been involved with the Independent Labour Party but also broke ties with the organisation after they rejected a proposal to aﬃliate with Soviet Russia. In 1920 she visited the country for the ﬁrst time, meeting with Lenin in Moscow, and investigating the life of women under communism by visiting children’s homes, communal ‘factory kitchens’ and educational organisations. She was clearly in awe of Russia, writing of her glee when at the theatre a group of peasants were given the Czar’s box, while a visiting American millionaire was given a standard seat. She would visit again in 1927, 1930 and 1936. She returned to the UK with her commitment to the working class strengthened. She became devoted to helping ease the suﬀering of those in areas aﬀected by war and famine, including in the UK and further aﬁeld in Ireland, Germany and Russia, leading her to becoming secretary of the Workers International Relief Organisation in 1922. Helen was also heavily involved in the worker’s strikes of this period, as unemployment rose in the UK. She was critical of the eﬀect this had on Glasgow, an industrial city, writing mournfully that ‘Instead of being part of the throbbing, pulsating life of the great city, the river had become a river of death.’ She continued her work with the Communist Party, and in 1929 and 1931 stood as a candidate in the General Election, but lost both times, which she attributed to a lack of funds and transportation. Finally in 1933, after a life in constant motion, she moved in with her sister Jean, and eventually settled in Dunoon. She was drawn out of her retirement however when ‘Like an old war horse my ﬁghting spirit arose’ at the dismissal of local women’s concerns by the Dunoon Town Council, and she became the town’s ﬁrst female councillor. It is clear her commitment to gender equality was lifelong. She remarried, to George Anderson a fellow member of the CPGB, and remained in Dunoon watching ‘the reﬂection of the moon on the river’ and completing her autobiography until her death in 1954. Despite what the publishing world of the 1950s may have claimed, it is her anecdotes and throwaway remarks (combined with a few rants and some complex politics), which allow the book to paint a vivid picture of a tumultuous Scotland gripped by two world wars, and Helen’s unique experience of it. Her descriptions of her trips to post-revolution Russia and of the conditions faced by suﬀragettes in British prisons, as well as her front-line position in the workers strikes throughout the UK in the 1920s are of critical historical importance. However, what conjured her spirit most strongly was her astonishing stories, shared with a healthy pinch of name-dropping; travelling to St Petersburg in 1920 on a rowing boat under cover of darkness, disagreements with the Pankhursts, dinner with Gorky in Moscow, hurtling through Scottish wind and rain in a motorbike side car when campaigning for the General Election, and of course meeting Lenin in the Kremlin (she writes of his ‘twinkling brown eyes’). Many of her insights still resonate today; with reference to her position in the centre of this vast political upheaval she writes ‘We are apt to think that the times we live in are startling and revolutionary, but what age is not?’. I was struck by how this sense of perspective places the aims of present-day feminism in a much larger narrative, and highlights the vital connection between steps towards equality today and those fought for by Helen and her contemporaries almost 100 years ago. Appropriately, the autobiography also brings to the fore Helen’s lifelong love of reading, and her steadfast belief in ‘the value of the written word’. 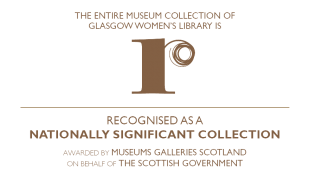 This, of course, is a belief which underpins the work of Glasgow Women’s Library, and which makes the exhibition here all the more meaningful. She reminisces about learning to write and of ‘mysterious letters and ﬁgures on the blackboard’, crying over Uncle Tom’s Cabin as a child, reading novels in ‘open deﬁance’ of her ﬁrst husband, and of meeting an elderly Russian woman who was illiterate until her later years and whose happiness derived from the ability to ﬁnally ‘say what is inside me’. Authors are dotted throughout the text, from Dickens, to Dostoyevsky, with particular admiration shown for Scottish poet Robert Burns. Her political development was led by reading protest pamphlets and the writings of Charlotte Perkins Gilman, Josephine Butler and Olive Schreiner. Through contact with all of this literature, she speaks of her ‘unlearning and learning’ as her understanding of the world around her developed through the perspectives of others. This admirable process remains equally crucial today. To that end, of course, it is through the written word that Helen is brought alive for us now, and through which we gain an important new view of the early twentieth century. Furthermore, and vitally, this re-assertion of Helen’s voice allows her to take her place in the greater story of Scottish feminism and activism, a tale which is still unfinished. Lesley Orr ‘‘Shall we not speak for ourselves?’ Helen Crawfurd, War Resistance and the Women’s Peace Crusade 1916-1918’. Online here. 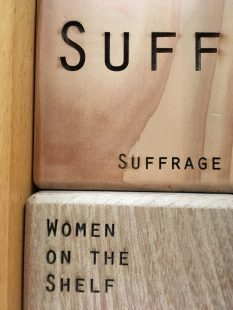 SHALL_WE_NOT_SPEAK_FOR_OURSELVES_HELEN_CRAWFURD_WAR_RESISTANCE_AND_TH E_WOMENS_PEACE_CRUSADE_1916_18 Roger McCarthy ‘Helen Crawford: From Suﬀragette to Stalinist’. (2014). Online here. This entry was posted in Blog, News and tagged with exhibition, Fiona Jack, Helen Crawfurd, volunteering, Vote100. This makes splendid reading. Clear, informative prose interspersed with anecdote brings Helen’s character to life. In fact she springs right off the page. A lady Glasgow should be rightly proud of. As Glaswegians we really appreciate our feisty women-a long and proud tradition. Next step -over to STV -what an amazing series the story of Helen Crawfurd would make and if nothing else it would inspire all women to get out there and vote. A well written article about someone I hadn’t heard of before. Thank you for bringing this forgotten piece of history back to life. A very informative article which gives a valuable insight into the troubled times of the past. Well written and interesting. A very interesting article. I had never heard of this very feisty Glaswegian, pity she wasn’t mentioned in the history lessons our children were given in school. Two reasons why her history was kept quiet. One, she was a pacifist and fell out with the Pankhurst family who supported WW1. Secondly, she was involved with the communist party. Married one of them second time round, George Anderson. An interesting and thought provoking article on Helen Crawfurd. Her determination and commitment shines through. An amazing woman, although one amongst many. A lovely well written piece. Very informative. forgotten area of female history to our attention. I am grateful and delighted to discover that there is a library dedicated to the history of women alone right here in Glasgow, my home town, which i was unaware of and look forward to future visits and exhibitions to further inform.